Little Gransden 2013 was one of the best shows on the calendar, and the news that Dave Poile and his team had attracted the year's most sought-after display item - the Battle of Britain Memorial Flight and Canadian Warplane Heritage Avro Lancaster pair, leading to a first-ever sell-out crowd for the venue, appeared to set the stage for this year's show to go one better. Dan O'Hagan reports from Cambridgeshire. Additional images by the UKAR Staff team. 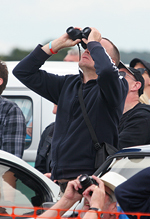 "Looking out onto the biggest crowd, certainly the largest we have had by some way and the full capacity of Little Gransden, was exciting and worrying in equal amounts, we just hoped that all would go to plan and we could send everyone home happy with memories and photos they would treasure for a long time. Judging by the feedback through Facebook, Twitter and other means, we did!" It's reckoned by the organising team that the actual crowd figure was somewhere in the region of 9,000 people, which put a strain on Little Gransden's size-limited facilities like never before. The show uses volunteers to marshal and staff the car parking and traffic management, and it is great testament to them that, save for a few snarl-ups, getting in and out seemed to pass with relatively few problems. That said, Adrian and the team are wise enough to realise that 2014 was the year that this show hit the buffers in terms of expansion - to try for an even bigger event here is beyond the realms of what is realistic: "We would never entertain a larger crowd at Little Gransden as the main limiting factor is public parking, followed shortly by the site layout. We moved the crowd lines to make space as we knew it was a sell out event. The Lancasters obviously contributed to this and we are not aware of any other aircraft that would bring as much interest. We may now consider limiting the crowd to a lower figure as some other events do to keep within our event management resources." An observation the UKAR team made on the day was whether there could be a possibility of scaling back the classic car element of the show, in order to free up more crowd space. The cars, it seems, are here to stay: "This point is always raised from the airshow enthusiast community and one we debate at meetings. It is not an airshow per se like Sywell or Shuttleworth, more a day out for families. Small children need more than just an air display to keep them entertained and the classic cars, steam engines, kiddies' fun fair, craft hangar and other attractions give it the eclectic mix that makes Gransden unique. 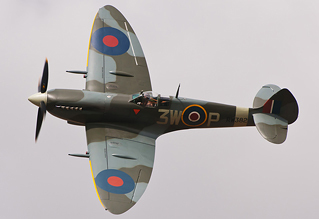 You will see more families having a day out at Little Gransden than at comparable air displays. One other point is that even if we had less classic cars, the public parking areas control the amount of people, so less classics does not automatically mean more public on-site!" There's no doubt that the extraordinary and unprecedented thirst for tickets was down to the presence of the Lancaster pair. Once again the questionable timing of the tour was thrown into sharp focus, coming after the big shows at Fairford, Waddington and Farnborough, thus putting considerable strain on smaller venues unable to match the insatiable demand to see these machines. The Lancasters rumbled into view perfectly on cue, at the end of Gransden's traditional service of remembrance. It was a genuinely moving moment to see these two wonderful aeroplanes in the same part of sky, though to call it a formation would be stretching it somewhat, as it would be to term the 360 degree underside-heavy routine a "display". An anti-climax after the anticipation? Possibly, yes, and certainly a let-down for any photographers in the crowd hoping that the big bombers might make use of the dog-leg crowd line. 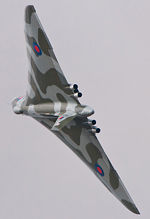 Disappointing too was this year's appearance by the Avro Vulcan. The previous year "Yes, That" Martin Withers had given a mini-display which was heralded as among the best airshow "turns" of the 2013 season, banking steeply around the bend, while keeping close to the spectators. Not so this year. Phil O'Dell and Kev Rumens were in the front seats and they flew XH558 much higher and much further away. A gear-down pass was a nice touch, though the undercarriage was stowed away before she'd reached the end of the crowdline. A trademark Rumens wing-over was the routine's highlight. 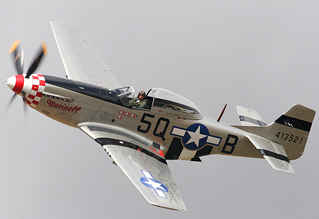 That's not to say the flying display wasn't without merit - Rob Davies returned once again in one of Maurice Hammond's drop-dead-gorgeous P-51 Mustangs, and put Marinell impressively through her paces, finishing with a low pass with the canopy pushed back. Clive Denney's demonstration of the Spitfire XVI, and Peter Holloway's virtual-VTOL appearance in his Fieseler Storch were also well-recieved, as was Ray Corsten's photographer-friendly performance in Radial Revelations' T.28 Fennec, finishing with a "dirty" wing-rocking pass, a neat addition and one other displays would do well to copy. The most disappointing warbird performance, sadly, was Peter Teichman's. 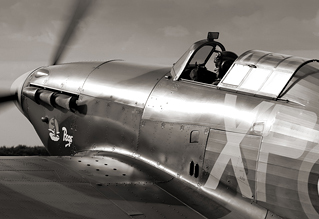 Flying his beautiful Hurricane IIb "Pegs", which looked stunning on the grass runway, his routine was anything but. By some margin the most distant of the solo displays, and flying in some of the poorest light conditions on the day, this normally exceptional entertainer flew a display which fell strangely flat - for the second Little Gransden in succession. As in 2013, and unlike his masterful displays at Shuttleworth, "PT" decided against using the natural curve in the display line, meaning views of his fabulous Hurricane were extremely limited. Regular attendees Captain Neville's Flying Circus never cease to be superbly watchable, and an unusual formation of Cessna Bird Dog, Auster AOP.11 and Ryan Navion could legitimately claim to be one of the displays of the day. Again, just as at the show twelve months previous, it was the lesser-anticipated types which caught both the eye and imagination. Though aerobatics are a fitting motif for Little Gransden displays, this year's display felt rather swamped by a succession of similar types. Lauren Richardson arguably took the honours for best solo aerobatic display away from Mark Jefferies, as her reputation as a Pitts pilot continues to grow. 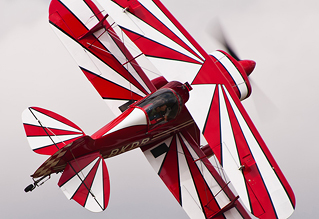 While aerobatic types can be extremely impressive at a venue of Little Gransden's size, the 2014 show simply had too many of them. One block of the display featured Extras by the bucketload, including a reprise of last year's excellent synchro with a 40% scale model, a four-ship team, and then Jefferies en seul. Perhaps spread across the whole four hours these items would have had more punch, but displaying one after the other got rather tiresome as the display lost energy and rhythm. When you add to the Extras further "aeros" by a Yak-52, Slingsby Firefly (apparently a late call-up for a sickly Yak 11), the TRIG Pitts duo, a Silence Twister and assorted, instantly forgettable Vans types, including the dismal Team Raven, that's a huge amount of similar aircraft to fit into a display, which was by mid-afternoon crying out for some real variety. Commentary, as usual here, was provided by Ken Ellis. He's part of the furniture at Little Gransden, and can be an acquired taste, but the biggest gripe must be the fact that he simply doesn't keep the crowd informed with details of what is going on - vital with an event as fluid as a flying display. With programmes sold out by lunchtime there wasn't even the excuse of keeping things under wraps to shift a few more brochures. Airshow crowds like to know what is going on - tell us what's to look forward to. Tease us with snippets of information about what's coming up next, or in the next hour. The microphone is not there for endless lame jokes, it is there to keep the paying audience informed. 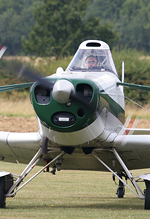 I really wanted to say nice things about Little Gransden 2014. I genuinely enjoyed my day there, and it was really great to see the place so busy, and so clearly thriving, but as with so many airshows this one ended up being much, much less than the sum of its parts. This was an airshow where everything around the flying was close to perfect, only to be let down by the air display itself. Charities, including the BBC's Children In Need are in line for their biggest windfall yet from the event. 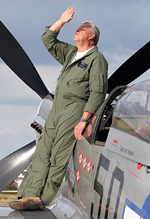 Adrian says a donation total of as much as £75,000 may be the legacy of this year's show, which despite Little Gransden 2014's shortcomings in the air, is the best news of all.